In many people’s imaginations, walled cities are associated with medieval Europe, but such cities exist all over the world. 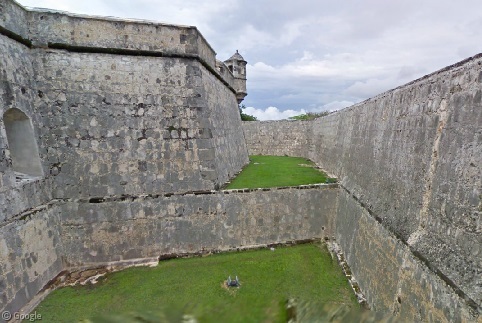 In this post we look at walled cities from around the Caribbean, most (but not all) of which are legacies of Spanish colonisation. We begin in Mexico with the city of Campeche. From its founding by the Spanish in 1540, the city was constantly attacked by English and Dutch pirates and privateers; enough so to warrant the fortification of the city beginning in the 1680s with a 2.6 km (1.6 mi)-long wall containing eight small defensive forts, or bastions, along with numerous other bastions constructed at various points along the city’s shoreline facing the Gulf of Mexico. 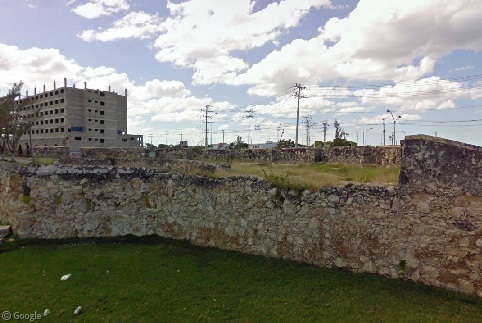 Today, much of the wall remains intact and defines the centre of Campeche, which was declared a World Heritage Site in 1999. 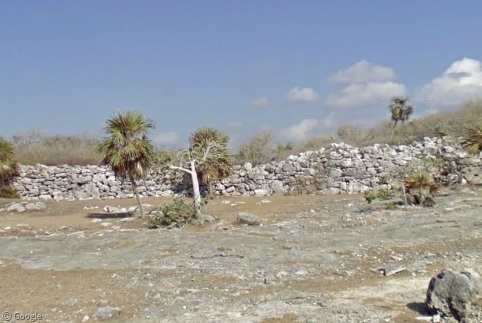 Here, we see the Puerto del Tierra (Land Gate), the main portal through the wall from the south. 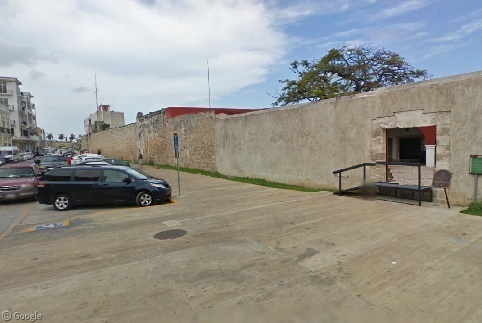 The bastions along the water no longer protect Campeche from outsiders; instead, they draw outsiders (i.e., tourists) in. While some bastions, such as Fort San Miguel, remain sprawling and impressive, others such as Fort San Matías are not so imposing these days. On the other side of the Yucatan Peninsula from Campeche lie the ruins of a much older walled city, the Maya port of Tulum. One of the last cities built by the Maya and one of their most important coastal ports, Tulum dates approximately to the year 1200 and had a population of just over one thousand. 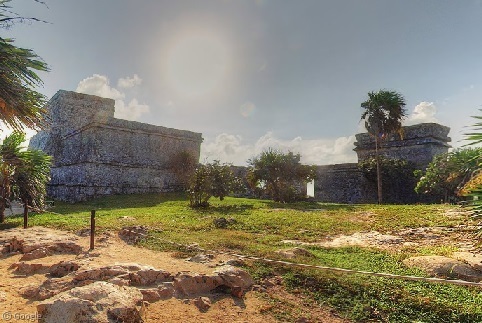 Protected from the east by steep cliffs overlooking the Caribbean Sea, the rest of Tulum was surrounded by a 5 m (16 foot)-high walll with watchtowers at the corners. 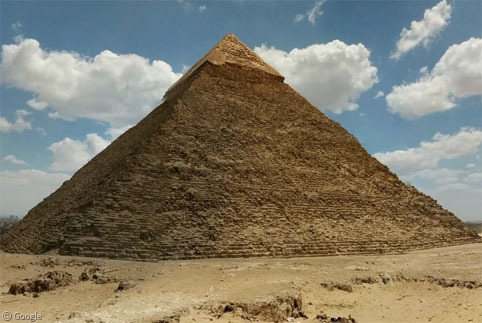 For being nearly a millennium old, the wall is remarkably intact today. 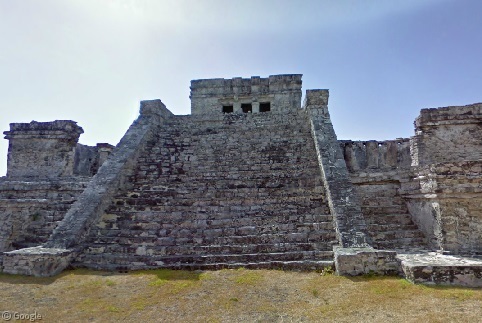 Among the buildings in the centre of Tulum protected by the wall include the Temple of the Descending God, which is attached to the centrepiece of the city, the towering El Castillo. While Street View has yet to arrive in Cuba, this list would be incomplete with mentioning Havana. Havana was walled by the Spanish in 1702 but would eventually outgrow its confines (at one point in the 18th century, the Cuban capital was the third-largest city in the Americas). By 1863, the walls had become a hindrance to the city’s growth and as such were dismantled. Today, the path of the old wall can be easily detected by following the Paseo del Martí thoroughfare at the western edge of Old Havana. 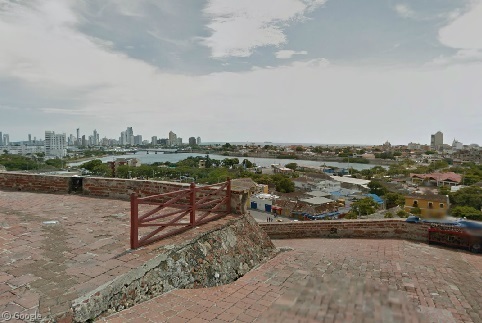 Not all is lost of the old barrier, however; this photo sphere provides an excellent view of the remains of the Castillo de San Salvador de la Punta, one of the two forts that guarded the entrance to the city harbour. 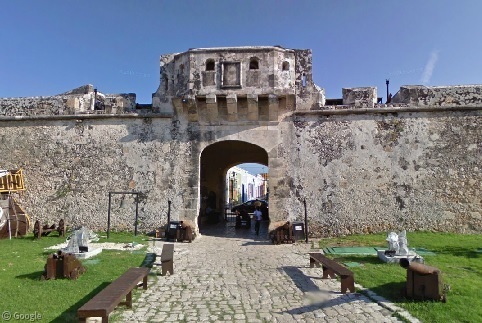 The capital of the Dominican Republic, Santo Domingo, has a defensive wall dating back to the 1500s. The major gate in the wall is known as Puerta del Donde (The Count’s Gate). 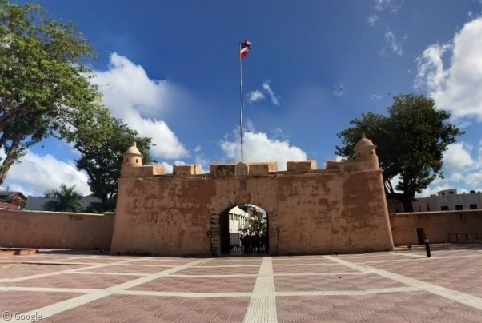 Though the gate was built in 1543, it is best known for being the site where Dominican independence was proclaimed on 27 February 1844. Moving eastward, we visit San Juan, Puerto Rico and its historic centre. 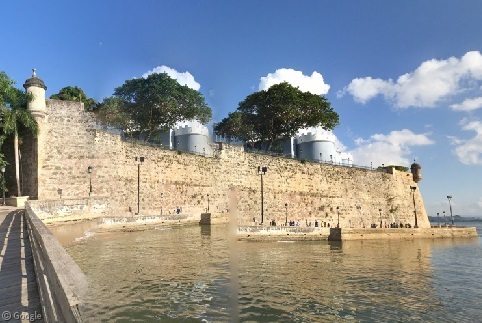 The oldest colonial settlement in Puerto Rico, Old San Juan was established in 1509 and sits on the west point of an island in the northwest corner of city. 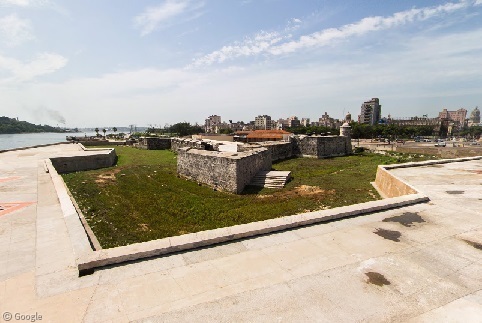 Like Havana, the eastern walls of the old city were demolished to make room for San Juan’s growing population. 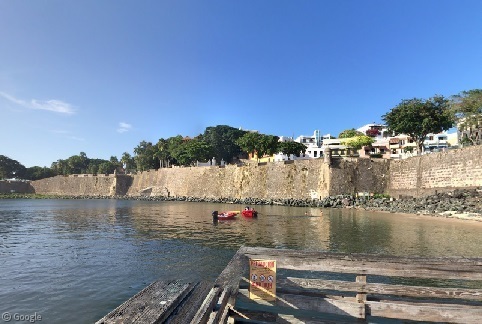 Thankfully, the western fortifications remain intact, including the 12.8 m (42 ft)-high wall that overlooks San Juan Bay. At the south end of the wall stands La Fortaleza. 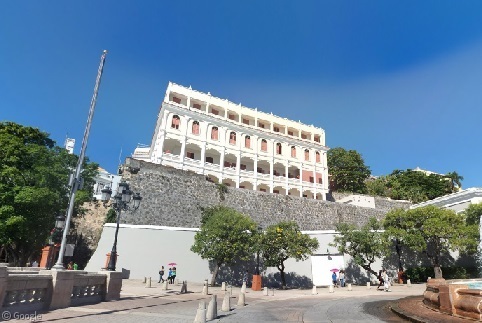 Built in the 1530s to defend the harbour, today La Fortaleza is the official residence of Puerto Rico’s governor. 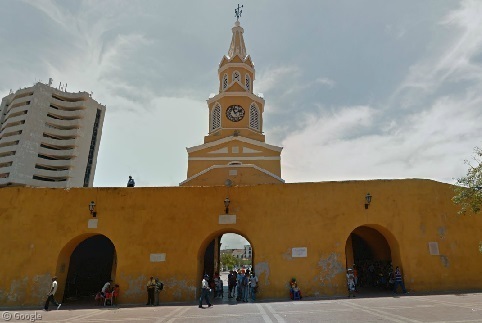 We end our look at Caribbean walled cities with the Colombian city of Cartagena. 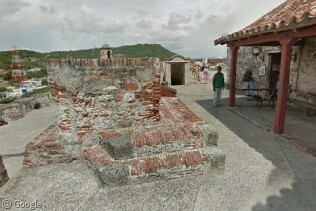 Like Campeche, Cartagena was fortified to protect from pirates. 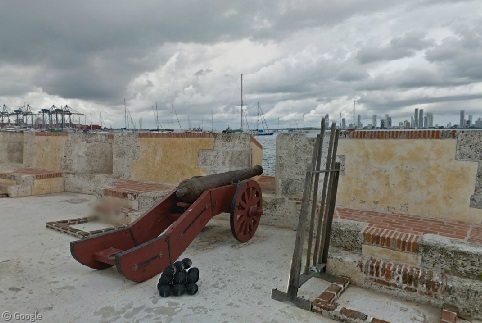 Many of the cannons are still in place along the waterfront wall, such as this one at Fort San Sebastian del Pastelillo. 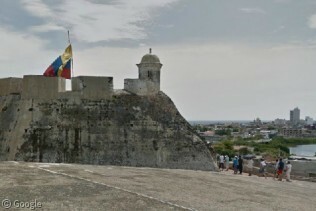 High on a hill above the old city of Cartagena sits Castillo San Felipe de Barajas, built in 1536 and expanded in 1657. Despite its distance from the sea, the fortress actually did fall to a pirate in 1697 (the French privateer Baron de Pointis). A major centre of the colonial slave trade, the red colours seen in the bricks were said to be from the blood of the slaves who were forced to build the edifices. Despite its turbulent history, the fortress is now a major tourist attraction in Cartagena owing to its high level of preservation. 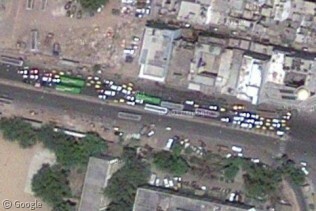 In the city itself, the wall is an integral part of the cityscape. Structures along the wall such as the Clock Tower and the Baluarte de Santa Catalina function as public gathering spaces where one can shop or take a leisurely stroll along the waterfront. 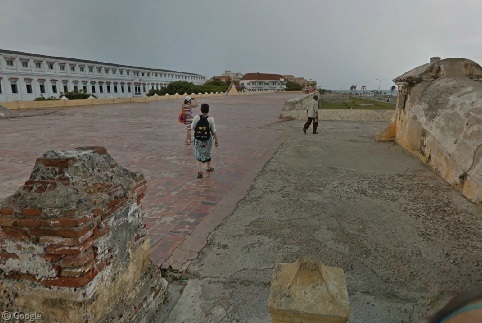 Perhaps the most striking feature of Cartagena’s wall is the Plaza del Las Bovedas (Plaza of the Dungeons). 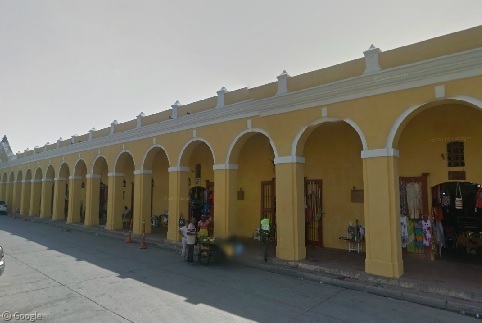 Built in the 1790s as a military prison, today the 23 cells of Las Bovedas serve as tourist shops. 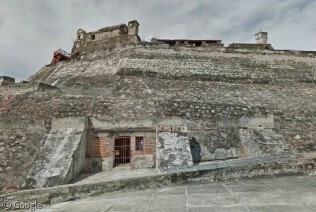 Have you spotted other interesting walled city features in Google Maps? Let us know in the comments.